Since 1988 leading Southern California restaurateurs Laurie Sisneros and Cary Hardwick have created a meeting place for LA and Orange counties in their award winning restaurant – Spaghettini Grill and Lounge. Located just off the 405 Freeway at Seal Beach Blvd., Spaghettini features exceptional Northern Italian cuisine and top name entertainment. In addition to outstanding food and service, Spaghettini is committed to excellence in the entertainment side of the business. Having built the Spaghettini Performance Lounge into one of the top venues in Southern California, Spaghettini attracts some of the top name artists in the business. These smooth jazz artists will perform at Spaghettini in between the next weeks: DW3, Jessy J, Slim Man, Will Donato, Jackiem Joyner, Eric Marienthal, Tom Braxton, Lao Tizer, Karen Briggs, Brian Hughes, Elan Trotman, Ard Sherrod, Gregg Karukas, Freddie Ravel, Michael Lington, East Bay Soul, Jeff Kashiwa, Marcus Anderson, Steve Cole and many more. If you are in LA don’t miss this meeting point of smooth jazz. The illustration is painted by Bettie Grace Miner as part of her exhibition. A collection of her Tuscan and Wine inspired Fine Art is to see at this restaurant. 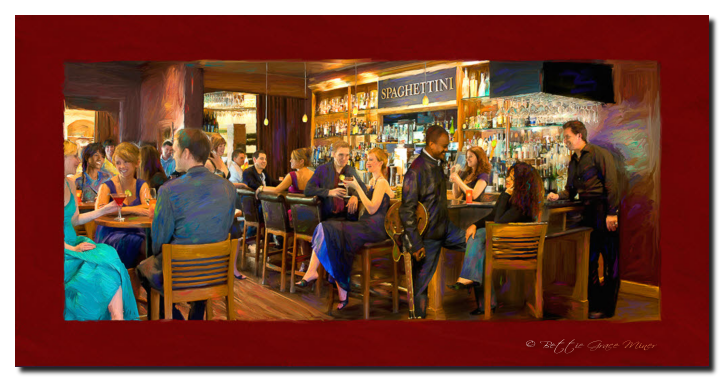 For more information about this restaurant visit http://www.spaghettini.com.